The amazing people at the Mazzoni Center in Philadelphia have done it again. 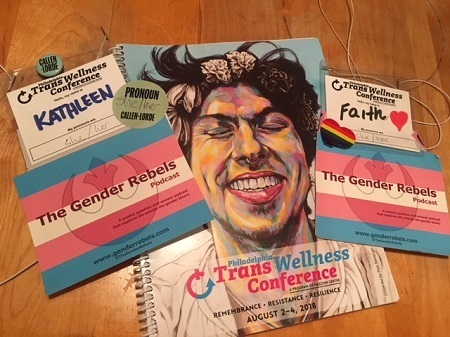 They organize the Philadelphia Trans Wellness Conference every year. This is a gathering of trans and cis doctors, lawyers, therapists, scientists, professors, vendors, social workers, health insurance insiders, artists, activists, poets, writers, YouTubers, podcasters, clergy, parents, nurses, comedians, entrepeneurs, and even a witch. All these fine people come together to work towards a world with greater access to resources and acceptance of transfolks. They present workshops, give talks, throw parties, and discuss and celebrate YOU. We describe our experience of our first year at the conference: the talks we heard (Seeing Myself in the Bible: Gender Minorities in Scripture, My Journey With Illegal Silicone Injections, Communication With Your Cis Partner, Getting FFS and Breast Implants Covered By Insurance, The Road To Desired Vocal Identity), the events we attended, and the joy of meeting some of our listeners in person! We hope we see you there next year!